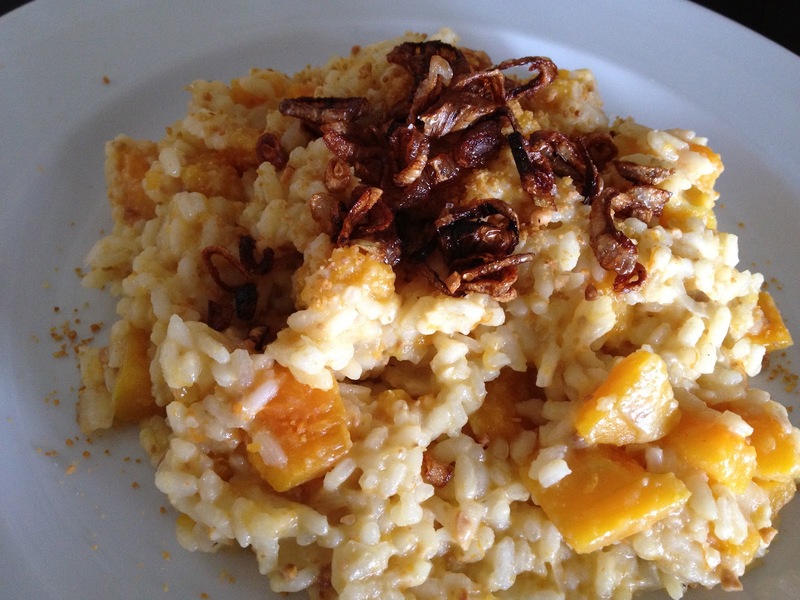 I used to think that risotto was one of those things that was too hard to make. But, alas, it is super easy and meditative. Once you get into it, it takes about a half hour to make. Truly a delicious dish. Prep everything: dice the onion, peel and de-seed the butternut squash and cut it into cubes, and mince the garlic. Sauté the onion in olive oil in a large skillet with sides. When the onions are translucent, add the garlic and sauté on a low flame until softened. Raise the flame to medium and add the butternut squash. Sauté until it starts to soften. Heat the water in pot with a spout. Add the rice to the vegetables and stir around until translucent. Add about cup of water and stir until absorbed. Keep adding water, stirring often until absorbed, until the rice is nice and fluffy. Add the most of the Cashew Parmesan and mix well. Drizzle with a touch of good olive oil, top with the rest of the parmesan and the crispy shallots. Enjoy! Cut the shallots into rounds and separate them. Combine the grapeseed oil and shallots in a small pot and cook over medium/high heat, stirring often, until the oil heats up and the shallots turn golden brown. Transfer onto paper towels and sprinkle with salt.